FDH Velocitel was recently awarded a five-year, $10M contract for architectural and engineering services to complete testing of tension in Tainter gate trunnion girder anchor rods on USACE-owned and managed dams nationwide. The U.S. Army Corps of Engineers (USACE) Louisville District (Louisville, KY) is the contracting entity. Tainter gate anchorage systems, which contain post-tensioned anchor rods, have been used in major U.S. dams since the 1960s and have recently experienced a growing number of rod failures. Approximately 150 dams across the U.S. use the post-tensioned anchor rods, with more than 50,000 post-tensioned anchor rods in the USACE inventory. FDH Velocitel's proprietary test will enable the USACE to safely and effectively manage this aging inventory. Congressman David Price (NC 4th District) and FDH Velocitel CEO Kevin Hostetler spoke at the contract award reception, held at the company's Raleigh office on July 22. The event included a demonstration of FDH Velocitel's proprietary nondestructive test (NDT) method, which can assess the integrity of trunnion anchor rods safely, efficiently and at a fraction of the cost of traditional test methods. "The award of this contract is an important milestone in the commercialization of an innovative NDT method to test critical infrastructure, and will sustain and add engineering and technical jobs in Raleigh as FDH Velocitel grows this service th roughout the nation," said Robert Lindyberg, PhD, PE, Vice President of Technology/R&D for FDH Velocitel. 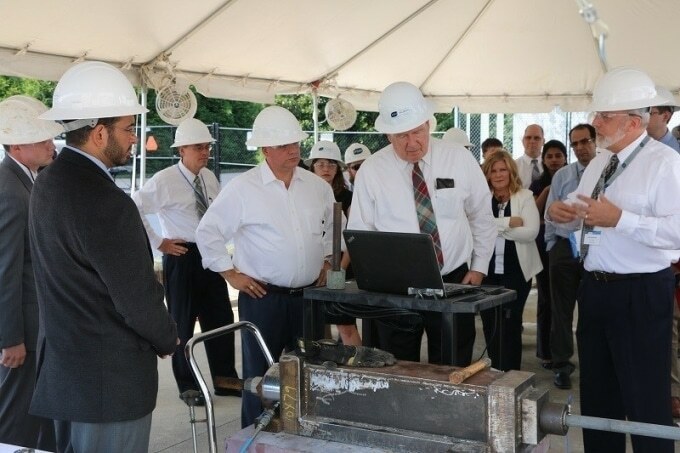 The development of this technology was made possible through legislation supported by Congressman David Price, which helped form the government-industry partnership that enabled the deployment of this innovative test method on USACE dams. "I am thrilled that FDH Velocitel has been awarded this grant to support their innovative work to inspect and strengthen aging dams," said Rep. Price. "Modernizing our nation's infrastructure will require close cooperation between government stakeholders and the private sector, and I am proud that a Triangle company is on the vanguard of this vitally important effort." Dr. Lindyberg added, "For the past four years, we have worked in partnership with the USACE Engineer Research and Development Center (ERDC) in Vicksburg, MS, to develop and deploy this service – which reduces testing costs by up to 90%, while significantly improving safety. We appreciate Rep. Price's support of this partnership, and the commitment of both the Congressman and USACE to protecting our nation's critical dam infrastructure."